If you missed part one of the Totally Rad collection you can find it here. I will post the third and final installment of the collection tomorrow. Electric Daisy is a white cream with white to yellow shimmer and yellow flower glitter. Remember how big of a deal floral prints were in the 90's? I might have had several dresses like that back when I rocked a french braid like it was going out of style. Electric Daisy was inspired by the floral prints that were big in the 90's. Pictured above is three coats with no base color. The formula is a nice consistency, but I did experience a little bit of drag. I'm almost certain that it was because of our hot and humid weather the day I was swatching. Instead of applying the flower glitter as it appeared on the brush, I applied the polish portion and dabbed on the flowers afterward. The flowers came out easily which made my application super successful. Slimed is a medium green holo. The formula was well pigmented and easy to work with. Shown above is three coats with no base color. I could almost get away with two coats, but I decided to go with three just to be on the safe side. As I was painting my nails I kept getting a whiff of something sweet and wonderful. After messaging Jennifer I found out that Slimed is scented with key lime pie. It was incredibly delicious! I love green as a color, but I've never found a green that really commanded my attention like Slimed does. If you were to own one green polish, this should be it. Blue Jean Baby is a blue shimmer with a bit of holographic pigment. This color was inspired by the JNCO jean company because everything was better with denim! This bright blue holo is blueberry scented to go with its blue sparkle. Blue Jean Baby is limited edition and will only be available until it sells out. The formula of Blue Jean Baby was a nice consistency and only required three coats for full coverage. I found the holo to be most noticeable in the sunlight. 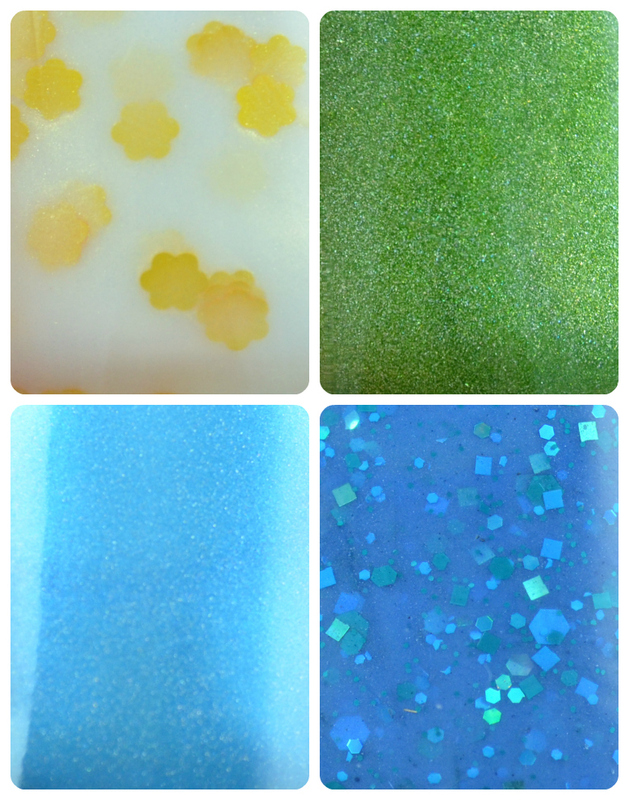 Jellyfeet is a blue shimmer packed with various sizes and shapes of blue glitter. Pictured above is three coats with no base color. I did experience a little bit of drag with this polish, but it was most likely from the hotter temperature outside. This color was inspired by the must-have jelly shoes we all wanted. They were so cool looking, but they really hurt your feet. Oh the pain we endure for fashion! Out of this set of colors, Slimed was my absolute favorite. The color plus the scent really took it to another level. Slimed is one of those colors I think everyone should have. Did you have a favorite in this set? All colors for the Totally Rad collection are currently available in the Finger Lickin' Lacquer store. Stay tuned for part three of the collection tomorrow morning. That green one is GORGEOUS! Great swatches and review! My favorite is Slimed, what an awesome green! It seriously blew me away. If you like the smell of key lime pie, that's certainly a plus! Mine too! There's something about a green holo that is just undeniable. I really like Slimed and Blue Jean Baby, though Slimed is definitely my favorite of this group.